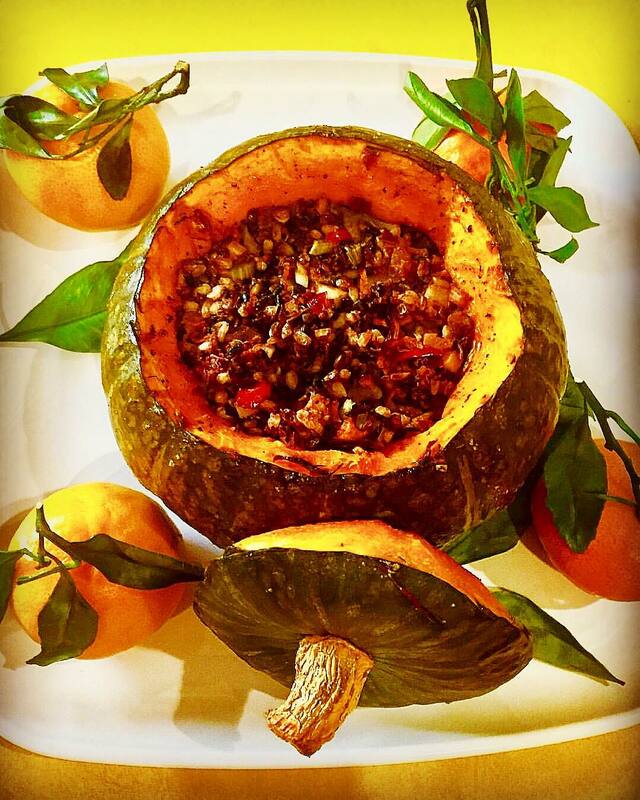 I have my good friend MJ, who makes every dish an artistic beauty, to thank for this recipe. 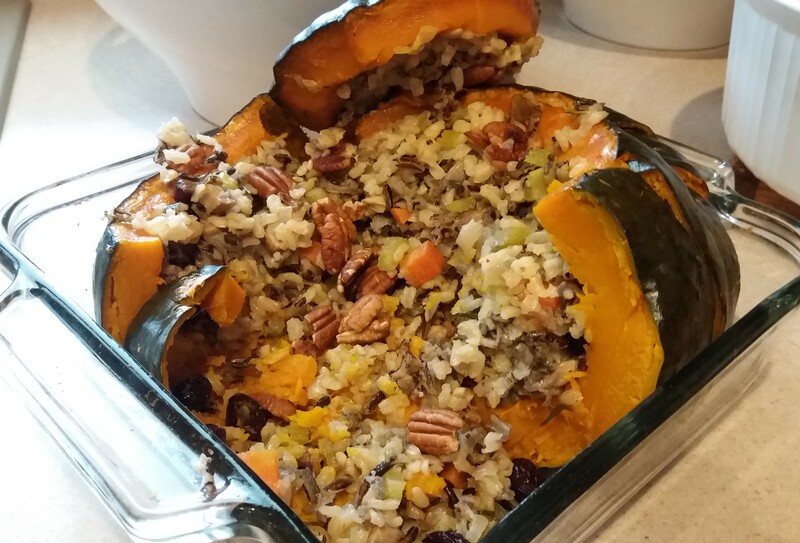 This dish not only presents itself so well on the Thanksgiving table, it is simple to make and the taste is amazing! The first step is to wash the rice and wild rice. Combine the jasmine brown rice and the wild rice in a bowl and fill the bowl with enough cold water to cover the rice. Rinse the rice thoroughly by combing through it with your hands and strain through a strainer. Rinse 1 or 2 times until all the dust has been removed. No need to keep rinsing until the water is completely clear as much of the cloudiness is starch from the rice and you want to keep this. Place rice in pot, add 2 cups of water or vegetable broth, a pinch of salt, cover and bring to a boil. Reduce heat to low and simmer 50 minutes. Preheat the oven to 400 degrees. With a sharp knife, carefully cut a round section around the stem at the top of the squash just like you do when you make a Jack-o-lantern. Set this lid aside for now. Using a spoon, clean out the seeds and feel free to save them for making pumpkin seeds another time. Lightly oil the outside and inside skin and place on a baking tray. Next, sauté the vegetables. Heat a skillet on medium heat, add oil followed by the onion. Sauté until the onion becomes translucent and then add garlic, celery and mushrooms. Cook for a minute or two then add thyme and black pepper. If you have some vegetable broth, add some in to slightly steam the vegetables and additional flavor. Add salt, cook for one more minute and then remove from heat. Ensure you are happy with the way these vegetables taste before continuing. Adjust any seasonings as needed. Add the dried cranberries to the vegetables and then combine the rice and vegetables mixing well. You are now ready to pack the pumpkin. 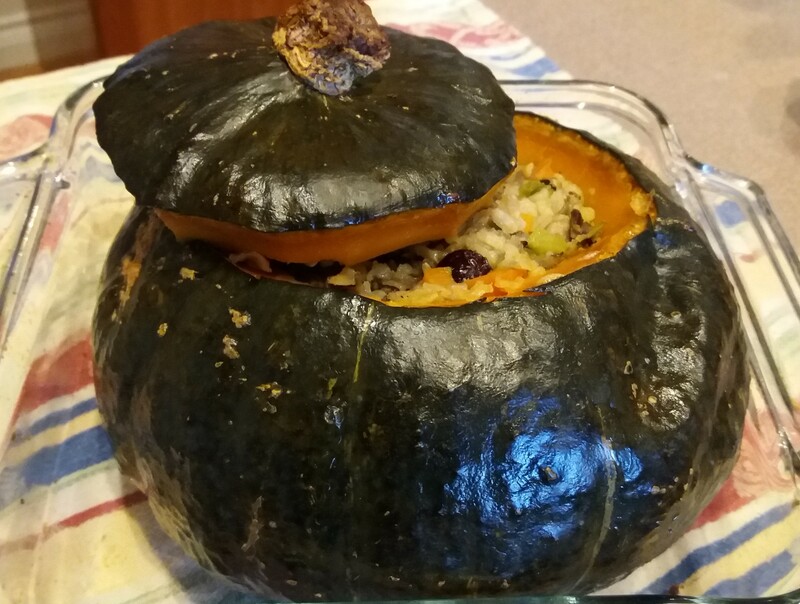 Place the grain and vegetable mixture into your pumpkin. Feel free to pack it in there. Put the lid on top and place in oven. Bake for about 90 minutes, removing the lid for the last 10 minutes. The pumpkin should be tender but not falling apart. When serving, you can cut the pumpkin into slices for a beautiful presentation. Garnish with toasted pecans.